Women's Unusual Silver Heart Necklace : LOVE2HAVE in the UK! 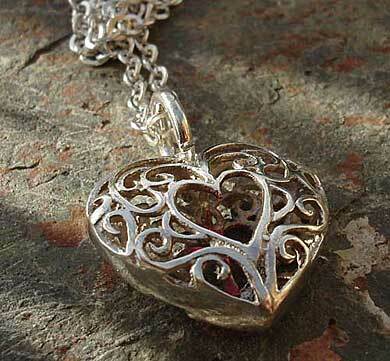 A women's unusual silver heart necklace. This necklace is by far the most unusual of all our silver heart-shaped jewellery. 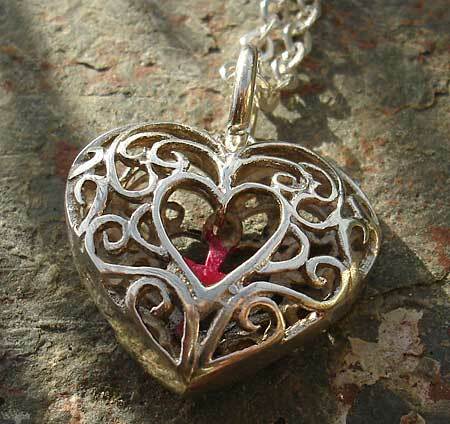 It features an intricate and ornate silver cage with a twin hearts design. The cage is heart-shaped and has a convexed profile with a central cut-out heart shape. Inside the cage sits a small red cross which swings freely inside the heart. The pendant measures 15mm x 18mm and comes on a silver chain which measures 18 inches in length. Matching earrings are also available too. All the silver comes polished to a shiny finish. 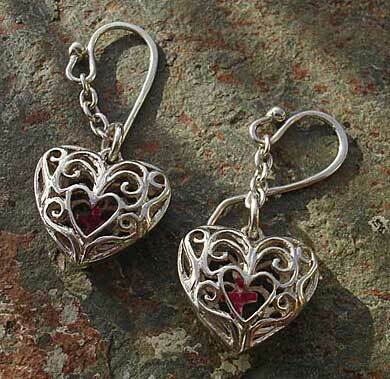 Matching silver heart cage earrings also available.